I don’t know about you — but my email box has been filled with sales so I can give to others. Don’t get me wrong, I love giving to others all year long. But too often we forget to give to ourselves! We forget to give ourselves time. Time to reflect how wonderful our family and friends are and how we are loved by others. We forget to give ourselves joy and laughter. Nothing is better for our soul than to spend time enjoying the freedom of worry. 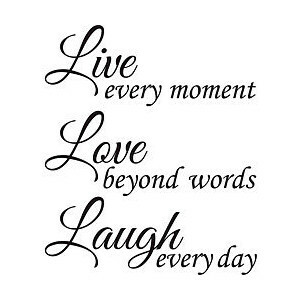 Enjoy life, live, and love! We forget to give ourselves rest. Our bodies need good relaxation — sense of “ahhhhh” at the end of the day. Our bodies need to relax to keep from collapsing into complete exhaustion at the end of the day, so we can wake up refreshed. I like to combine my time at the end of the day to reflect how great my day has been with relaxation so when I do go to bed, sleep comes quickly and I feel refreshed in the morning. Most of all — we forget to give ourselves good food! Good nutrition feeds our bodies so we can live a healthy life so we can continue to enjoy our friends and family for all the years ahead!! Each year so many people start out with New Year Resolutions — but by February many a rule will be broken. So why create a list you know you’re not going to keep? A dear friend of mine once told me: “New Year Resolutions were lists destined for failure, therefore, I’m going someplace new for vacation each year.” How cool was that? I wasn’t her only traveling companion on these adventures, but I can say I was privileged to many of them before she passed away with cancer. Now with 2012 right around the corner — I’m thinking about what my list will look like. Hmmm. I know some items are on the list twice! 😉 I don’t want to forget those, LOL. This entry was posted in Body, Mind, Spirit, Food/Nutrition and tagged 2012 new years resolutions, family, friends, give thanks, giving, good food, health, Holidays, life, love, New Year, New Year Resolution. Bookmark the permalink.